At the QBTC you will be working next to other entrepreneurs who have similar goals and opportunities. You’ll discover the common areas that make our facility more than just an “office.” We believe that success is achieved when like-minded professionals combine their experience and ingenuity. As a member of the QBTC family, you'll have access to business assistance from our Executive Director, in all phases of management and development. You'll also be able to participate in advertising and community awareness programs, and other marketing initiatives. In cooperation with educational institutions you'll have access to business training opportunities through the QBTC. Eliminate much of the time, effort, and expense in obtaining services and equipment required in your business because they are either provided at no cost or at a minimum cost to QBTC tenants. When you spend as much time at the office as most new business people, you'll truly come to appreciate the non-traditional amenities offered by the QBTC. 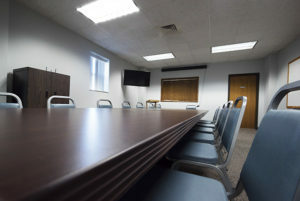 On our second floor, which is also the ground floor for our main parking lot at 3rd & College, just inside the main doors, you'll find a quiet conference room you're free to use. A kitchen with sink, refrigerator and freezer, coffee pot, and other items necessary items is conveniently located next to the conference room. Also on the second floor are the main QBTC offices and Rita Vilseck Secretarial Services. A copier, fax machine, and other business machines are available to use for a nominal fee. Each floor has a common landing area, hallway, and men’s and women’s restrooms which are cleaned and maintained by QBTC staff. Public elevators and stairs make it easy for your customers to get to you. 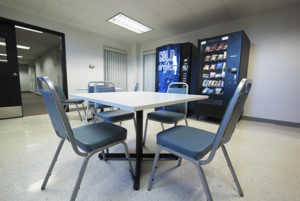 The fifth floor boasts a large kitchen and dining area complete with sink, refrigerator and freezer, microwave, soft drink and snack food vending machines, and much more. The fifth floor is also home to QBTC's conference rooms. They provide over 864 square feet of public space. The rooms are lit by overhead lighting as well as by large windows that overlook the parking lot. The conference rooms are available to all tenants to use, which includes the use of tables and chairs. The conference rooms open onto the kitchen and dining room as well as the main fifth floor hallway. Parking at the QBTC is easy. Our main parking lot to the north of the building on 3rd & College streets has spaces for 80+ vehicles. The lot easily accommodates the personal cars of your regular staff and any trucks, delivery vehicles, or work-dedicated vehicles required to maintain your growing business. The level parking lot has two main entrances. One is to the north on College Street, and the other is directly across from 3rd Street/Gardner Expressway/IL Hwy 24. Both of these have ample room for vehicles large or small to enter. There is also off-street parking on the 3rd & Oak, or south side of the building. You can also get to the main parking lot from Oak Street. The parking lot is lighted twenty-four hours a day, all year round. Winter snow and ice removal is provided by the Quincy Business & Technology Center for the safety and convenience of your staff and customers. 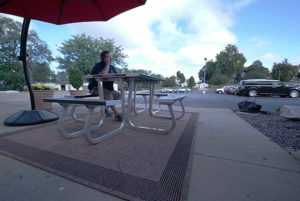 Stop by some afternoon and take a look at our parking facilities and see just how well they'll mesh with your business! The Quincy Business & Technology Center makes shipping and receiving convenient for your business. In addition to United States Post Office mail and package delivery and pick-up, we're on regular Fed-Ex and UPS delivery and pick-up routes. The QBTC also has shipping and receiving docks located adjacent to our main parking lot. Since this lot borders 3rd Street/Gardner Expressway/IL Highway 24 – a regional traffic artery – this means drop-shipments, LTL, and other dedicated carriers can find you without difficulty. You and your staff have access to the loading dock area 24 hours a day, 7 days a week, 365 days a year. The area includes four large loading bays that are otherwise secured. Together with our freight elevators, this means your vendors can deliver materials directly to your office or other facilities without difficulty. It also means you can manufacture and ship product from your QBTC space directly to customers. And the best thing about shipping and receiving through the QBTC? It's all included at no additional cost to you! In short, the QBTC offers a host of amenities and services that make the decision to locate in the Quincy Business & Technology Center an easy – and profitable – one!